5-gallon bucket of lukewarm water. You might also find it helpful to have a stepladder. Extend your awning completely out. Hose off any loose dust, dirt and debris. In a 5-gallon bucket of lukewarm water, mix in mild soap as per manufacturer's instructions. Never use detergent to clean your awnings. With a soft-bristle brush, lightly scrub the canvas. If you don't have a soft-bristle brush, you can wrap a soft towel around a push broom and use a couple of large rubber bands to secure it in place. Start at the top and work your way down using a circular scrubbing motion. Rinse thoroughly. Repeat a second time if necessary. Allow the canvas to air dry thoroughly before closing the awning. For particularly tough stains or mildew, we suggest using OxyClean® spray. Let it sit on the stain for 5 or 10 minutes, scrub it with your soft-bristle brush, then rinse it off thoroughly. Acrylic fabrics may loose their water-shedding and protective coatings after two or three years. We highly recommend using 303 Aerospace Protectant and 303 Fabric Guard to revitalize these qualities. 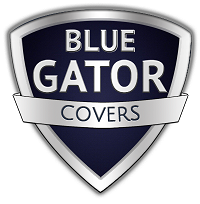 If you have any questions or would like to talk to someone about you RV awning needs, please feel free to call Blue Gator at 239-652-0916.